Farmers in the western San Joaquin Valley are facing another year with curtailed water allocations, while fish populations are as low as they’ve ever been. Something, clearly, isn’t working, and agriculture industry lobbyists say they know what the problem is. “Our water delivery system is broken,” says Gayle Holman, spokesperson for Westlands Water District, a large San Joaquin Valley farming region expected to take a hard hit this year from reduced water deliveries. Holman argues that environmental restrictions against pumping water from the Delta are harming farmers’ livelihoods without doing any good. There is no doubt that fish species such as winter-run Chinook salmon, delta smelt and several others are slipping toward extinction – but why? Farm lobbyists say removal of water from the Delta has little to do with the declines and that non-native species are a bigger problem. They say striped bass are eating imperiled fishes at unsustainable rates, and over the past few years water users have supported multiple legislative efforts to cull striped bass numbers. “Predation [on salmon] is a huge problem we haven’t addressed,” says Mike Wade, the executive director of the California Farm Water Coalition, a group that lobbies for farmers statewide. Research conducted in 2012 on the Tuolumne River by the private research firm FishBio found striped bass stuffed with baby salmon. To many water users, this is clear and damning evidence that striped bass are a lead driver in the decades-long decline of the Central Valley’s native fishes. But the problem isn’t so simple, according to numerous fishery scientists. The entire ecosystem is collapsing, and striped bass numbers are plunging about as rapidly as those of salmon, smelt and other species. Rosenfield says so much water is now being taken out of the Delta on an annual basis that what was once a thriving estuary functions today more like a large, warm-water swamp, friendly to some non-native fishes, such as black bass, catfish and sunfish, but very hostile to most native fishes. “These [farm groups] always want to remove the predators, and that is not the solution,” Rosenfield says. Rather, he maintains, restoring the Central Valley’s waterways and their seasonal flow patterns to something resembling their natural state would prompt a response in native fish numbers. It is well known that gushing winter and spring floods can essentially wash juvenile salmon safely out to sea in a protective smokescreen of mud and silt. For this reason, salmon hatcheries often release their smolts immediately after large rain events. Scientists such as striped bass expert David Ostrach, U.C. Davis' Peter Moyle and Carson Jeffres, and California Trout’s Jacob Katz, have all argued that the loss of annual flood cycles, as well as riverside floodplain habitat, has made survival for small fish in the Central Valley’s waterways almost impossible. FishBio’s Doug Demko, who led the Tuolumne River research, says he has observed that young salmon do poorly when river and Delta flows are reduced. Striped bass were introduced to California in the late 1800s. The fish took well to the Bay and Delta. As a species, they established themselves, naturalized and boomed. For about 80 years striped bass thrived. Ostrach says there may have been 4 million adult striped bass in the Bay-Delta system in the 1960s. There may have been even more in the decades prior, before close scientific fish surveys had begun. Meanwhile, Chinook salmon – especially the commercial important fall run – supported by fish hatcheries, remained fairly strong. In 1951, the U.S. Bureau of Reclamation's Central Valley Project began operating a massive pumping station in the southern Delta. About a decade later, the California Department of Water Resources introduced a similar pumping station to support its own conveyance system, the State Water Project. Pumping rates grew steadily from about 1.5 million acre-feet (1.8 billion cubic meters) in the 1960s to the 4 million acre-foot level by the 1970s. At the same time, the decline of the Delta ecosystem began in earnest. This deterioration has been closely tracked by the California Department of Fish and Wildlife, which started an annual survey called the Fall Midwater Trawl in 1967. The idea was to take a yearly snapshot of fish abundance by dragging the same-sized net over the same parcels of water on about the same days every year. In the survey’s first year, department biologists calculated an abundance index of 19,677 juvenile stripers . That number has dropped steadily since, to anywhere from 1,000 to 5,000 through the 1980s and 1990s. Over the same time period, winter-run Chinook salmon, as well as salmon runs in the San Joaquin River, followed a similar downward trajectory. Then, in the early 2000s – after a rapid increase in water pumping pushed Delta exports to record rates of more than 6 million acre-feet (7.4 billion cubic meters) – the decline accelerated, with the striper index ranging from a few dozen to about 300. Bar graphs showing the survey results for several other species look nearly the same, with abundance of each bottoming out to almost nothing in the early 2000s. Delta smelt are now considered essentially extinct in the wild. The simultaneous crash of multiple Delta fish species has been so dramatic that biologists even have a name for it – the Pelagic Organism Decline . Farm lobbyists remain unconvinced. Wade, at the California Farm Water Coalition, says attributing fish declines to water diversions is erroneous and causes needless harm to growers of fruit trees and vegetable crops in the western San Joaquin Valley. “There is no science that shows the export pumps at the south end of the Delta are having a long-term impact on salmon or delta smelt,” Wade says. But the correlation between water pumping and fish declines grows even stronger when fall-run Chinook salmon are added to the equation: In the early 2000s, as the Pelagic Organism Decline began, the Sacramento’s fall run finally caved, as well. Record low returns of the fish came three years after the record high Delta exports. The entire fishery was closed for the first time in 2008. In a 2009 report , scientists with the National Marine Fisheries Service attributed the decline to a combination of poor ocean conditions as well as inland habitat problems. “We recognize … that the rapid and likely temporary deterioration in ocean conditions is acting on top of a long-term, steady degradation of the freshwater and estuarine environment,” the authors wrote. So how much water must be left to flow through the estuary? A certain amount is needed just to keep saltwater from entering the Delta and the pumps themselves. Rosenfield says that from October through March, 1.97 million acre-feet (2.43 billion cubic meters) were allowed through the Delta for this essential purpose – or about 12 percent of the water that fell as precipitation in the Central Valley drainage basin in that time. While fish are often blamed by farmers for hindering operation of the Delta pumps, endangered species protections were responsible for only 664,000 acre-feet – or 4 percent of the basin’s total precipitation – that entered the Bay in that time period. 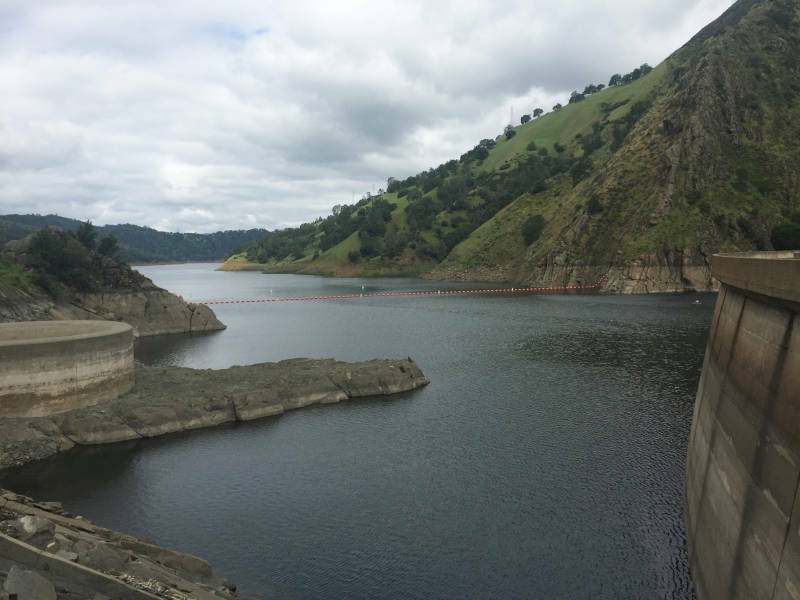 In an average year, more than half the Central Valley’s winter–spring runoff is captured behind dams or pumped out of the Delta, according to Rosenfield. That’s too much. Scientists have calculated that a healthy Delta ecosystem would need closer to 75 percent of that flow moving through the estuary and into San Francisco Bay. But water alone may not be enough to help the fish. Jacob Katz at California Trout says Chinook salmon also need riverside habitat that floods annually. Katz has led research showing that juvenile salmon that are given access to flooded rice fields beside the Sacramento River grow exceptionally fast and, ultimately, have vastly better odds of avoiding predators and reaching the ocean. This habitat has been mostly eliminated from California’s rivers by levees and berms. As for the Bay-Delta’s striped bass population, it has been dwindling for years. Ostrach says there may be as few as 250,000 adults today. He says there is no doubt striped bass have suffered for the same reasons as salmon and smelt. The decline of multiple estuarine species at once suggests the environment they share in common is under extreme pressure.